One of the best things about making a majority of your gifts is the ability to sample the goods along the way. Today I’m sharing a fabulous truffle recipe. The basis of the recipe comes from a site called Your Cup of Cake I didn’t modify the basic ingredients only the directions. I’ve now had two taste testers (that didn’t include myself) who both approve so I figure this ones a keeper. Truffles are perfect for the holidays as they are decadent, something you don’t often buy for yourself, but secretly want. They are also fairly easy to make, even with a small child helping, and a little goes a long way. I made a base truffle recipe and then rolled then in 5 different toppings so I could give a variety of flavors to each recipient. Using a double boiler, add all ingredients to top glass bowl and turn on low heat. Stir frequently. You’ll notice that slowly but surely the chocolate will melt. Keep stirring! This should take about 10 minutes, or until you have a smooth, velvety mixture. Pop in the fridge uncovered for 1 hour. After your hour is up, cover tightly with plastic wrap and leave in fridge overnight. The next morning, after your cup of coffee and requisite children’s tv programming, pop the bowl out of the fridge and prepare to get messy. Line a plate with tin foil, set aside. Add your toppings to small bowls and place in front of you. Now the fun begins. Using a small spoon, scoop out a bit of the truffle mixture and roll in the palm of your hand to form a ball. Drop in a topping bowl and let your child coat the truffle. Repeat until all truffle mixture is gone. 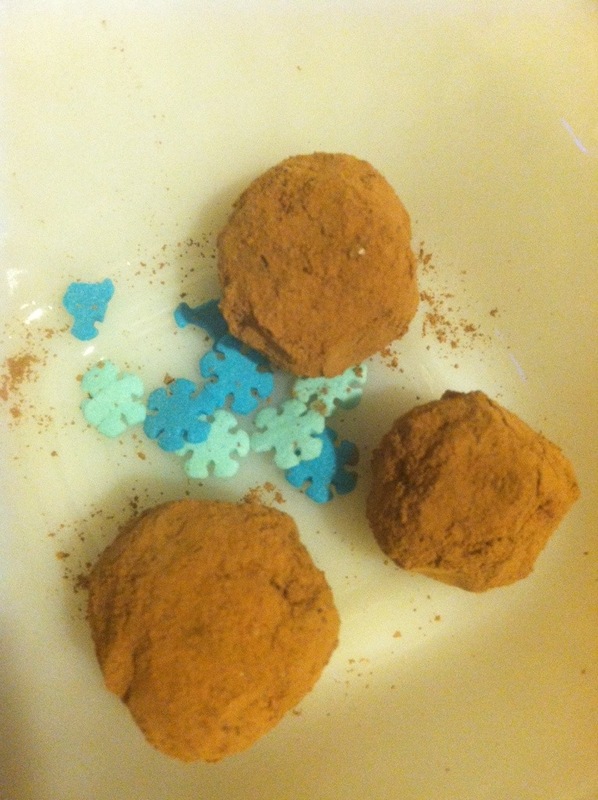 We made about 25 good sized truffles (Z ate a lot of the mixture as we went…) Pop plate in the freezer for one hour. Because I’m giving these as gifts I needed to freeze these but ensure they still remain fresh. To do this double line a Tupperware container with foil, then plastic wrap, then truffles in candy dividers, plastic wrap, foil then the top. I’m freezing for a couple weeks-but I followed the same directions for freezing other types of chocolate and have never had a problem.